The need for lake & river surveys constantly increases as human activity expands in these areas. While navigation remains a main focus, nowadays other applications such as hydraulic construction inspection, biomass and resource control, pollution tracking or historical sedimentology represent a significant market share. Operational and technical challenges in this new type of inland survey often relate to difficulty of access to survey sites, significant constraints on equipment size and weight, energy, as well as the need for acquiring very high-resolution data with a limited crew. As iXblue strives to develop complete solutions for demanding environments, tightly integrated sensors and software are proving to be a successful solution to cater for these inland water survey requirements. The Inertial Navigation System delivers precise positioning data even when GPS is masked by bridges or mountains, while the compact sub-bottom profilers deliver precious high-resolution data depicting near-surface geology and sediments. 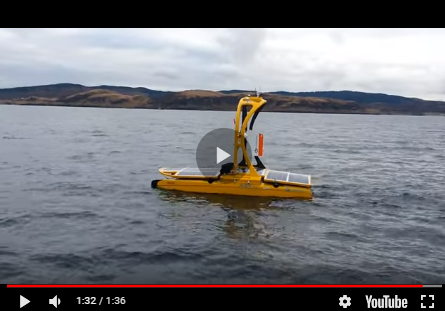 This equipment can be pole-mounted on small crafts, allowing for quick response times and access to difficult areas with perfect geo-referencing. The multi-sensor software processes the collected surface and sub-bottom data both in real-time and offline, adding see-and-act capability during survey and 2D/3D tools for interpreting the complete dataset. The two following case studies describe instances of how users benefiting from these technologies are succeeding in surveying such challenging environments. A consortium of French universities, including the LIENSs Laboratory of La Rochelle University, the EDYTEM Laboratory of Chambery University and the GEOAZUR laboratory at Nice University, studying the high altitude lakes of the southern French Alps, has succeeded in conducting seismic surveys, under the direction of Eric Chaumillon (La Rochelle University), using a balloon-mounted iXblue ECHOES 5000 sub-bottom profiler. Since all devices were airlifted by helicopter, the seismic surveys were conducted from a small inflatable boat. Coring sites were chosen in real-time from dense pseudo-3D seismic grids. In the Allos Lake study, the explored sediments revealed ~160 graded layers of flood deposits, stretching over the last 1,400 years. Comparisons with records of historic floods support the interpretation of flood deposits and suggest that most recorded flood events are the result of intense meso-scale precipitation events (Wilhelm et al., 2012). There is no evidence for any major changes in erosion processes in the catchment since the Medieval Warm Period. Records at Allos Lake, combining SBP profiles and coring, bear witness to repeated intense precipitation events over the last millennium, with a low flood frequency during the MWP and more frequent and more intense events during the Little Ice Age. Subsea compact and stable assembling perfectly fit the purpose of such surveys and most requested scientific accuracy layer discrimination. Affiliated Researchers utilised an iXblue ECHOES 10,000 to conduct sub-bottom profiling surveys beneath an inland lake in order to map sub-terrain conveyance of contaminated groundwater. As part of ongoing groundwater investigations at a former military installation, Affiliated Researchers conducted a sub-bottom profiling survey of the stratigraphy beneath an adjacent inland lake. Affiliated Researchers successfully utilised an iXblue ECHOES 10,000, high-resolution sub-bottom profiler (SBP) to survey the clay, sand, and gravel substrates beneath the lake for purposes of mapping the potential conveyance of contaminated groundwater. For this project, Affiliated Researchers used the high-quality iXblue ECHOES 10,000 SBP system, capable of 5-15kHz variable chirp frequencies and 3” resolution. The project Hydrogeologist was very impressed and pleased with the performance of the ECHOES 10,000 SBP system, as it was able to penetrate to a depth of more than 25’ into the clay, gravel, sand substrates, and provide detailed image-data of the lake bed stratigraphy. The SBP data were compiled to develop digital terrain models of the stratigraphy of the lake, and to enable the mapping of potential channels of groundwater conveyance. the powerful and versatile Delph software used for data collection and processing. The ECHOES 10,000 SBP system performed beyond expectations, providing a wealth of geophysical data on the sub-bottom stratigraphy, that will prove invaluable to the project scientists, engineers and managers in their work to further environmental restoration efforts in this area. Whether inland or at sea, a fully integrated SBP solution transforming transducer signals into real-time or post-process geophysical & georeferenced image display demands top-level acoustic systems expertise.